Fr. Carlos Miguel Buela, founder of the religious family of the Incarnate Word, was born in the city of Buenos Aires on April 4, 1941. 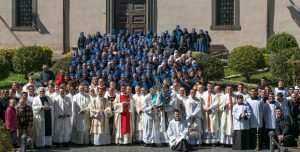 He was ordained a priest on October 7, 1971, in the crypt of the Sanctuary of Our Lady of Lourdes of Santos Lugares (Bs As) and the following day celebrated his first Mass in the Chapel of the Virgin of Luján. He has been a teacher in “St. Charles Borromeo” Minor Seminary of the Archdiocese of Rosario; professor of Dogmatic Theology in the Instituto Superior de Cultura Católica (Rosario); professor in the Institute “Our Lady of Guadalupe” (Rosario); professor in the School of Catechesis for the San Martín Diocese (Buenos Aires); professor in the Diocesan School of Formation for Catholic Leaders for the San Martín Diocese (Buenos Aires); professor of Dogmatic Theology in the Facultad de Derecho de la Universidad Católica Argentina (UCA); professor of Sacred Scripture and Dogmatic Theology in the “Courses of Catholic Culture” at the same university; professor of Sacred Scripture and Dogmatic Theology in San Isidro Seminary; spiritual director and teacher in San Rafael’s Diocesan Seminary (Mendoza) and in the Religious Seminary María, Madre del Verbo Encarnado. 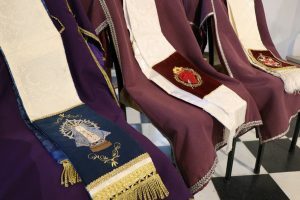 In addition, he has given invaluable service in the parishes of Nuestra Señora de la Merced and Nuestra Señora del Rosario (San Martín Diocese—Buenos Aires). He has written various books among which the following stand out: Catechism for Youth; Youth in the Third Millennium ; Servidoras; Sacerdotes para Siempre; Nuestra Misa; Pan de Vida Eterna y Cáliz de Eterna Salvación; María de Luján; Fátima: y el sol bailó; and Juan Pablo Magno. He has also published numerous articles in various journals. He is a great promoter of the Spiritual Exercises of St. Ignatius of Loyola (having already preached to more than one hundred groups of exercitants), tireless preacher of popular missions, and founder of various Homes of Mercy.